Shallow Cogitations: One Degree Closer To Kevin Bacon? 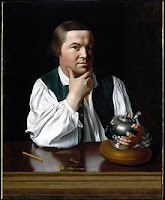 A parody as well as an interesting use of metadata to determine that Paul Revere is a terrorist. So, there you have it. From a table of membership in different groups we have gotten a picture of a kind of social network between individuals, a sense of the degree of connection between organizations, and some strong hints of who the key players are in this world. And all this—all of it!—from the merest sliver of metadata about a single modality of relationship between people. I do not wish to overstep the remit of my memorandum but I must ask you to imagine what might be possible if we were but able to collect information on very many more people, and also synthesize information from different kinds of ties between people! But I say again, if a mere scribe such as I—one who knows nearly nothing—can use the very simplest of these methods to pick the name of a traitor like Paul Revere from those of two hundred and fifty four other men, using nothing but a list of memberships and a portable calculating engine, then just think what weapons we might wield in the defense of liberty one or two centuries from now. Do you know why Obama killed Anwar Al Awlaki? It's not because Awlaki was instrumental in fomenting an imminent attack or whatever mofomenting excuse they eventually invented to make the hit look Constitutional. They hit Awlaki because he was a node who connected the web to unconnected networks of humans. They hit Awlaki the way they'd take out a server. The NSA has spent a trillion guided by the precept that metadata represents individuals. Obama and the military increasingly see humans as avatars at best, but more simply data. The best Clapper can do is claim to be a sort of Fascist digital librarian, secretly collecting the involuntarily collected documents of our personal lives, and cataloging the content so he can more easily find and read it at his leisure. We are not people to them. We are expendable data points. They will slot us into the web using their own classification schemes. They will impose their order on us. They are not limited to tracking our affiliations. They can rearrange the connections, rewrite the content, delay delivery of a message, change the results of your search, change your dosage, create more intersections with the web at every point of your day. Their worst fears are ummediated human to human connections, the reporting of those connections in raw form to the web, and the revelation of their own private secrets. The maintenance of digital surveillance of a population inevitably requires violence against humans who pass unmediated information. Passing information without authorization from the regime is the fundamental definition of terrorism in the digital age. All information on humans must be centrally accesible and access must be hierarchical. They must know more about you then you know about them. They must know more about you than you know, or can remember, about yourself. You can never see your own files. You can never check out a book from Clapper's library, not even though you paid for it. Not even though you wrote it. If you ever did, they would have to destroy you, and dictate your final chapter. The Clapper Library is like the Hotel California: You can check in anytime you like, but you can never leave. Except I guess they force you to check in. I'm also puzzled why everyone assumes that The Clappers collect read-only documents, particularly when we know they have made disinformation techniques part of both foreign and domestic strategy. Why wouldn't they have a read-write capability? How hard would it be for them to, say, add a few points to the President's popularity? Just intercept and answer a few calls from the pollster. Goose the approval ratings of surveillance while they're at it. Cause, you know, security. If not, why not? Why not make sure the vote arrives at the most secure outcome? So the "right people" win? Given the mandatory checkin rules, the checkout difficulties, and the notable lack of pink champagne on ice, I'd suggest Obama-Clapper's Library looks more like Gitmo. "Make no mistake, NSA can and will perform its missions consistent with the right to vote as enshrined in the Constitution and all applicable laws. But senior leadership must understand that today’s and tomorrow’s mission will demand a powerful, permanent presence in voting software in both primary and general elections." The NSA is like Gitmo because, goddamit, sometimes you just gotta force feed and catheterize the American public. Control what goes in, record everything that comes out. As a former librarian with over 40 years experience, I found Clapper's analogy to Dewey Decimal Classification more revealing than he intended. The Dewey number does not just aid in the identity and retrieval of a book. The number tells its physical location, and its subject matter. It associates the book with others. The number is actively assigned; it is not a passive data point. Although Clapper meant to minimize NSA actions, his analogy worked against him. Clapper exaggerates the distinction between metadata and content. Metadata created by a phone call IS part of the content of that phone call. Calling your priest is different content than calling your ob/gyn. Although libraries use metadata extensively, NSA curation of metadata sounds more similar to archival work. Clapper meant to make the NSA seem less creepy by comparing it to libraries which are usually open, popular, benign places. But if you know how libraries and archives actually work with information, the analogy makes the NSA sound very active and invasive. When you've even pissed off the librarians, Mr. Clapper, you're toast. The Guardian has a different take on Congressional reaction than the US-based press, like the Times. For one thing, they say Fourth Amendment, not just "privacy." It looks like Congress is accusing the President of lying when Obama says it briefed them. Looks like a particular letter was never received by our representatives. Hey, I wonder if there is a federal agency that might have the capability to interfere with information delivery to our elected officials? You can't assign a Dewey without knowing the content of an item.